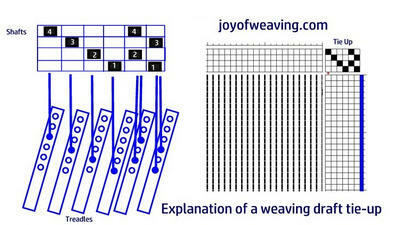 To understand a weaving draft, imagine that you are floating above your loom looking straight down at it. 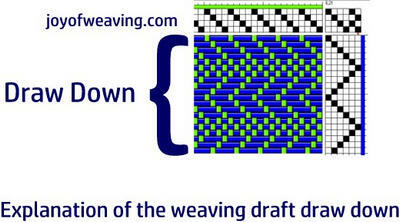 A weaving draft is the graphic representation of what you would see. 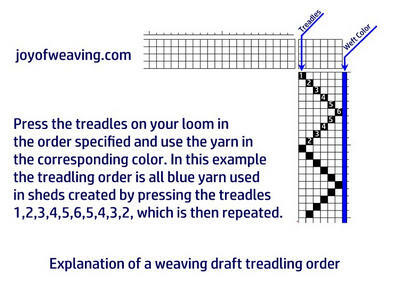 There are 4 parts to the weaving draft: the tie-up, the threading, the treadling and the draw down. 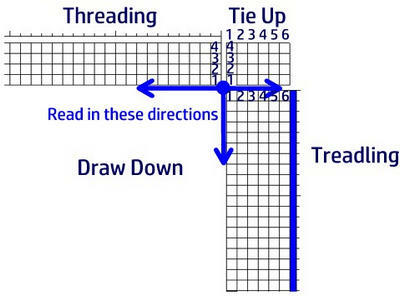 The tie up grid is usually located in a corner between the threading and treadling grids. It tells you which treadles get attached to which shafts. 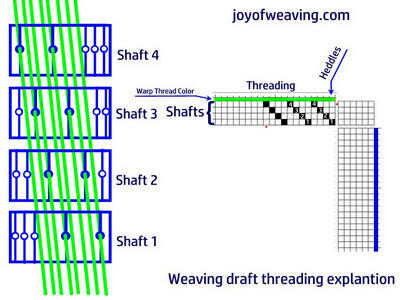 The threading order grid, usually located at the top, is the horizontal grid for your warp. It tells you which colored yarns go in a heddle on which shafts. The vertical grid is your treadling order. It refers to your weft. It tells you which treadle is pressed and which color yarn is used in the shed created by pressing that treadle. The draw down is a representation of the woven threads. It gives you an idea of what the design might look like. I will be including an instructional video in the near future, but for now, I hope these diagrams help you understand a little more than you did before you got here. :) Happy Weaving! This was extremely helpful!! Thank you. So if this patter were to be done on a 4 treadle 5 would be shaft 4&2 together and six would be 3&1 ? Yes. You would actuate shafts 1&3 at the same time and shafts 2&4 at the same time. If your loom only has 4 treadles (which is all that a 4 shaft loom ever needs) search the internet for "walking the treadles". Wouldn't it! If only more people would use my affiliate links so that I could afford good video equipment. muchas gracias es muy bueno .